Eskimo Joe's was the brainchild of Steve File, a pal of Stan Clark since the two were in fifth grade. One fateful Sunday afternoon in May, 1975, Steve proclaimed, "Hey, I'm gonna open a bar!" Stan said, "I know where there's a two-story building for rent. I'll go in partners with you!" Within minutes, these two wild and crazy guys had agreed to rent the building at 501 W. Elm. Steve came up with the name Eskimo Joe's, and Bill Thompson, a freshman commercial art student, drew the famous logo with a magic marker. "I loved it the second I saw it!" Stan says. And so, Eskimo Joe and Buffy were born. 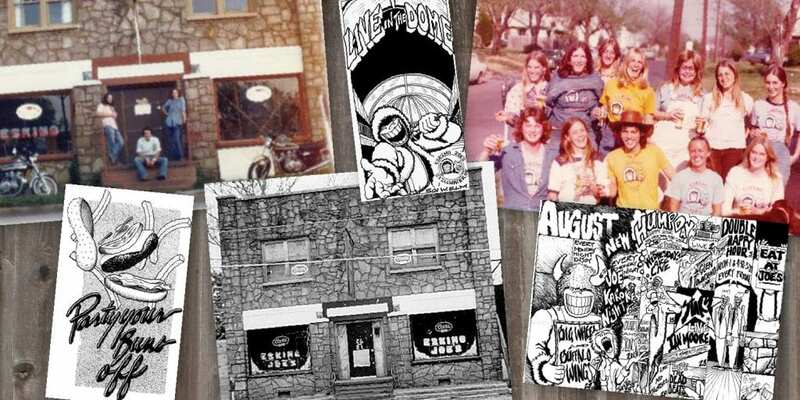 Eskimo Joe's opened July 21, 1975, serving ice-cold beer, red-hot music, and great-big smiles, both on the proprietors' faces, and on the front of the 72 T-shirts available for sale on day one. In the beginning, Joe's shirts were sold from behind the bar. The first shirts sold out in a week, and soon became so popular that the wait staff could no longer keep up with the demand. The enthusiasm that Steve and Stan had for their customers and the business made Eskimo Joe's different. "The key to success in any field or endeavor is enthusiasm!" Clark proclaims. Joe's was quick to gain a loyal following and soon became known as "Stillwater's Jumpin' Little Juke Joint." In 1984, after the drinking age was raised from 18 to 21, Eskimo Joe's became a full service restaurant. Stan has joked, "I was thrilled to find out in 1984 that more people eat every day than drink everyday!" He had bought out File's interest in the company six years earlier to become the sole owner of Joe's. With these changes, people of all ages came to enjoy the hospitality of Joe's, including their burgers known as "Joe's Specials," chicken sandwiches known as "Fowl Things," and Cheese Fries that were actually endorsed by the elder President Bush during the 1990 OSU commencement ceremony. As Joe's popularity grew, so did their annual birthday bash. 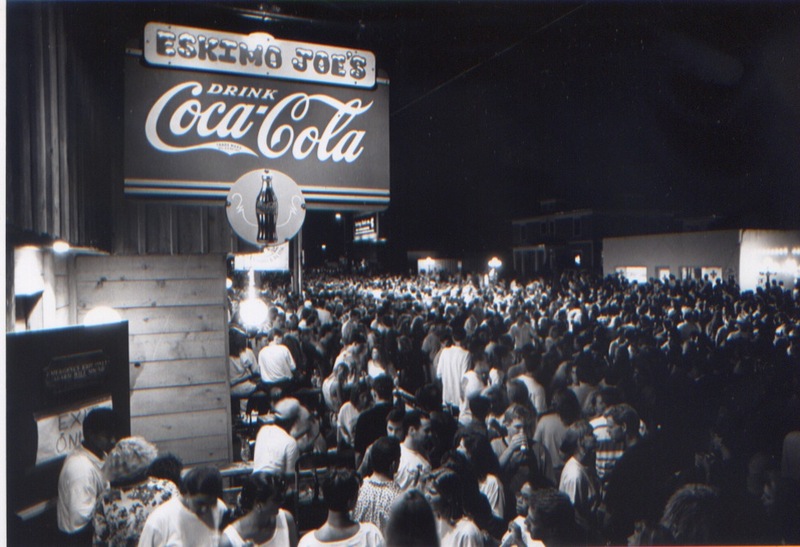 To celebrate the 10th anniversary in 1985, the party spilled onto Elm Street, marking the beginning of the Eskimo Joe's street party that would become the largest single attraction to Stillwater, except for OSU football. During the first week of July, Joe's traditionally releases an originally designed Anniversary T-shirt. By the nineties, Joe's anniversary bash attracted thousands of fun-loving Joe's fans from across the nation. Shown here is a shot of the 16th anniversary that spilled far beyond Elm Street. The crowd allegedly reached over 65,000! The Eskimo Joe's anniversary celebration continues to be an annual reunion each July attracting friends and alums from all across the country. It's a great opportunity to renew old acquaintances and relive fond memories of college years. Join the hot fun in the summertime during the week of July 21 to become a part of Eskimo Joe's famous tradition. 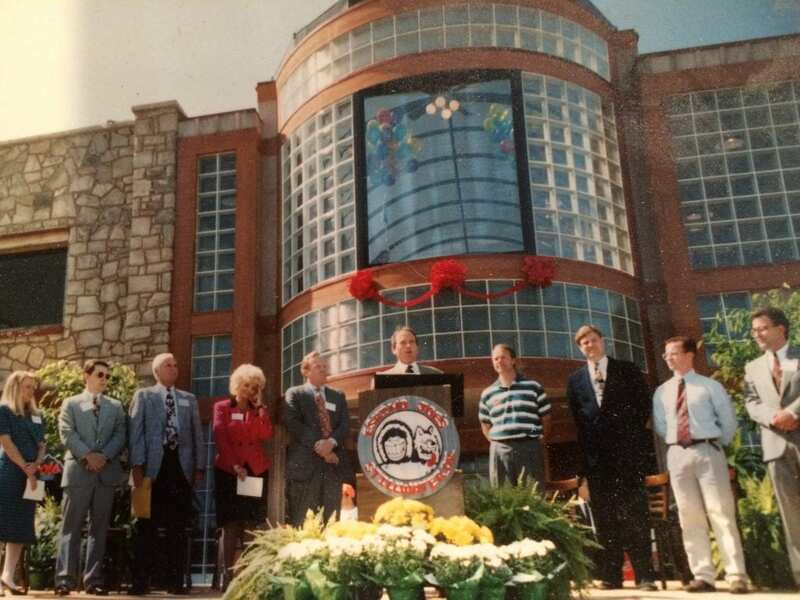 In 1991 construction began on the Eskimo Joe's Dome. The Dome expansion doubled the seating capacity of Joe's and featured a retractable glass roof that slides open or close, depending on the weather (very cool!). The Joe Dome was built in place of the open-air beer garden that was also very popular. The Dome "opened" on July 17, 1992. A ribbon cutting ceremony was held which featured presentations from special guests including U.S. Senator Don Nickles. We also made significant changes to our place and created a To Go entrance and upper east side seating by tearing down the beloved atrium and we cut the ribbon for the first of a few expansions in July 2010. The second part of our project was to create more space for our clothing store and in the fall of 2011, we opened the expanded Eskimo Joe's Clothes. For years we've wanted to create and enjoy a great outdoor seating space and in the spring of 2012, we opened an upper level patio. Next, we expanded our kitchen so that we can provide even better service to our guests. Here's a shot of what the Eskimo Joe's footprint looks like today - quite a difference from our early days back in '75! Joe's has changed a lot over the years, but our basic philosophy will always be the same. We show our guests a good time and provide a wonderful work environment for all team members. We're proud to call Stillwater our home and enjoy giving back to its community. Come out and see for yourself why Eskimo Joe's is Stillwater's Jumpin' Little Juke Joint!